Penmanship is the technique of writing with the hand using a writing instrument. The various generic and formal historical styles of writing are called "hands" whilst an individual's style of penmanship is referred to as "handwriting". 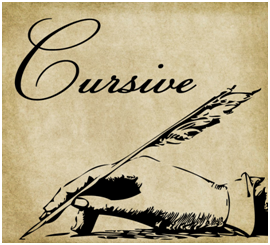 The biggest controversy to take place in the world of penmanship is happening right now: The Common Core education standards dictate that cursive will no longer be taught in elementary schools. And things are getting pretty heated. Seven states—California, Idaho, Indiana, Kansas, Massachusetts, North Carolina and Utah—are now fighting to keep cursive in the curriculum. 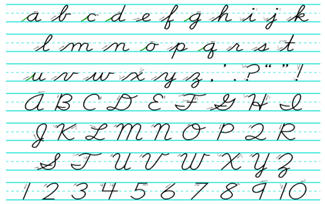 I remember being so excited for third grade when I would FINALLY be able to learn fancy handwriting like all the “big kids.” Cursive was presented as something special and advanced and we all wanted to know how to do it. As our teacher handed out our new writing instruments I was thrilled to have my very own ballpoint pen. Being a student of Catholic schools in the 1960s I was subject to hours of the Palmer method of writing practicing my ovals and squiggles. I, for one, hope this time honored tradition continues as it gives me an excuse to use my finest pens!